8 students from our school participated to the Athens Model United Nations from 2nd to 4th March 2018. Click here for more information about AMUN. 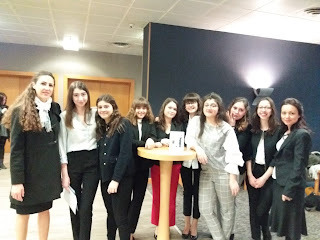 8 students from Lycée Charles de Gaulle participated to MUNESCO from 16th to 19th March. It was a great experience for our students. After the preparation during the year, we finally went to BLIS on Friday evening (16/03/2018). The first day was for the opening ceremony and dinner. Food was delicious and we had the opportunity to meet new people. Only one chance to make a first impression. Second day, we started committee sessions. At the beginning, we started by making groups according to issues. Then, we wrote resolutions and debated on these. The issues were about world’s current problems. On the third day, we also debated and voted. Best resolutions were passed to the general assembly. During the last day, we voted for the resolutions with all of the delegates in general assembly. And at the end, the Munesco conference finished with the closing ceremony where we watched videos and listened to speeches. To summarise, this 4-day experience was great. It helped me to meet new people and see how the United Nations works.